Evan currently plays percusssion and tours with folk acts Sam Kelly and the Lost Boys, The Willows, and Georgia Lewis. He has also performed with Seth Lakeman (Robert Plant). He seems to appear on nearly every new album we review, so we decided to find out more about one of the busiest musicians on the folk circuit. SF: When did you first start to play the drums and who or what was the major influence in that decision? EC: I started when I was 9 years old with drummer Alex Reeves (Elbow, Dizzee Rascal). He is a fantastic musician and really nurtured my early interest. However, it was a few years later when I met percussionist Damien Manning that really set me on my path. Damien plays in the West End’s Lion King and is a true master of authentic African and Brazilian rhythms. He took me under his wing, introducing me to styles I never knew existed. He brought me into a group he led in Brixton called the Paraiso School of Samba, one of the few traditional Brazilian-style samba schools with roots in Rio. I was very young and in a unique position surrounded by incredible dancers and older drummers from all over the world. Damien helped me craft my own style, coaching me on drums like repinique and caixa, but also taught me how to perform and work with others. He would also kick my adolescent ego’s behind if I got too cocky. Something I am eternally grateful for! Damien’s energy and prowess formed the core of how I play and even now when I play the bodhran, I approach it like I’m still in the ‘Bateria’ with him. The sheer scale of his knowledge and outlook on music are what drove me to turn it into a career. I still get the chills when I see him play and remember 11-year-old me watching him and thinking ‘This! This! I must do this!’ I owe him everything. SF: You are involved in so many bands, sessions and projects, how do you organise your time? EC: Trial and error with very tolerant families and band mates. My calendar tends to look I’ve lost a game of Tetris. When I first started playing with Sam Kelly and The Willows, it was a case of taking whatever we could get, even if that meant driving from Brighton to Edinburgh then on to Cumbria but via Devon. Luckily things are more organised now and we all stay in contact with each other. Our mothers are brilliant at organising us too. SF: We know you from playing in the folk music genre, but you also play rock and jazz, etc. Is it difficult to move from one style of music to another? EC: The last few years I’ve been lucky enough to record and tour with IAMTHEMORNING in Russia. I’d look up and see Marjana Semkina pirouetting past the grand piano and string section in a huge concert hall, innocently singing about burning down houses. I then had to fly back to play with Seth Lakeman and Sam Kelly in Cornwall. I did start to question my reality when I went from arson to mining disasters to whale hunting in less than a week. That was probably the biggest style shift to get my head around. I’ve always been drawn to rhythmically complex and syncopated music and I think those elements are fundamentally at the core of most folk music. Look at guitarists like Jack Rutter and Jenn Butterworth. Their grooves are so monumentally tight, you can’t help but stomp your foot! I actually think the biggest challenge is adapting to each genre’s audience. Every scene views drums with varying degrees of enthusiasm or trepidation. Sometimes I get audience members coming up after a show saying ‘I thought you played very musically and surprisingly quiet!’ There is still some stigma attached to drums in folk, but it’s up to the player to perform appropriately in each musical environment. SF: I was once told it takes 21 years to learn to play the bodhran. Is it a difficult instrument to master? EC: You never stop learning and I am nowhere near mastering anything. In fact I couldn’t play the bodhran when I joined Sam Kelly. 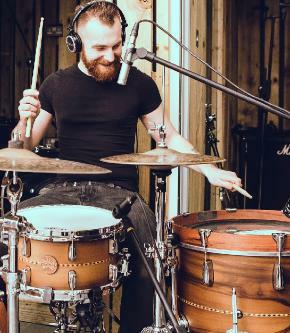 Luckily Cormac Byrne set me up and I instantly fell in love with the drum and his style. I had to find shortcuts to get gig ready, so drew from previous experiences. All my grooves have elements of samba and kit in them, but I’ve started introducing more traditional techniques, plus a few other crazy ideas. The bodhran has this unbelievable sonic potential. I spend a lot of time listening to traditional players and then I’ll go and plug my bodhran into a guitar pedal board and play along to Norwegian metal bands. You can draw from so many styles and players. I love the learning process and the idea of another 21 years of that seems pretty good to me. SF:We recently read about an interesting project you are involved in called ‘Shards’. Tell us something about it? EC:I’m currently recording my first solo EP, OCIPINSKI, and the first track, ‘Shards’, came out as a single in July. It’s a collaboration with artists from the UK, Russia and Iceland, blending elements of folk, prog and classical music. It features musicians like Georgia Lewis and Toby Shaer, Russian pianist Gleb Kolyadin and Icelandic violinist Karl James Pestka. The EP is inspired by my grandfather, Jerzy Ocipinski, and his time with the French Resistance and Free Polish Navy during the Second World War. It’s been so inspiring rediscovering his story, and combining that with this line-up of musicians has been a dream come true. I hope you like it.